I've always wanted to have my own place. I enjoy taking care of a house and yard, and I have strong feelings about how they should be managed, which differ from popular customs. But it's even more important for me to have my own time, and the best way to do that was through dirt cheap shared rentals, couch surfing, housesitting, and other ways of not having my own place. In 2004, with money I saved up from a file clerk job, I managed to buy ten acres in the woods an hour north of Spokane. My first thought was to live there, which turned out to be unrealistic. But I was still happy to have a place to plant fruit trees and generally let nature go, and I planned to eventually build a cabin where I could stay in the warm months, and travel in the winter. Then in 2011, through the early death of my mother, I was able to buy a house. More precisely, I saw in 2010 that at some point in 2011, I would have enough money to make a down payment on the worst house in San Francisco, or a pretty good house in Seattle or Portland, or pay cash for a city block in Detroit, or a modest house here in Spokane. Portland and Seattle are culturally tempting, but because of my personality, going into debt was never an option. It feels like setting my hair on fire, and I would not do it even if it seemed like a good move financially. Anyway, I've been based in Spokane for a while, because I had family here and it was close to my land. We have a four-season climate, a nice river, friendly people, and low risk of natural disasters. Maybe you should sell your house on the coast and move here! 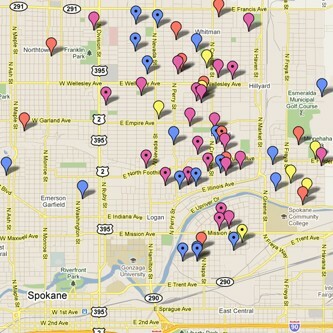 After deciding to stay in Spokane, I had to narrow down the location. The suburbs are right out: they lack both natural aliveness and urban aliveness, and you need a car to get anywhere. I wanted to be deep enough in the city that I could easily ride my bike around, but also close enough to the highway for an easy drive north. 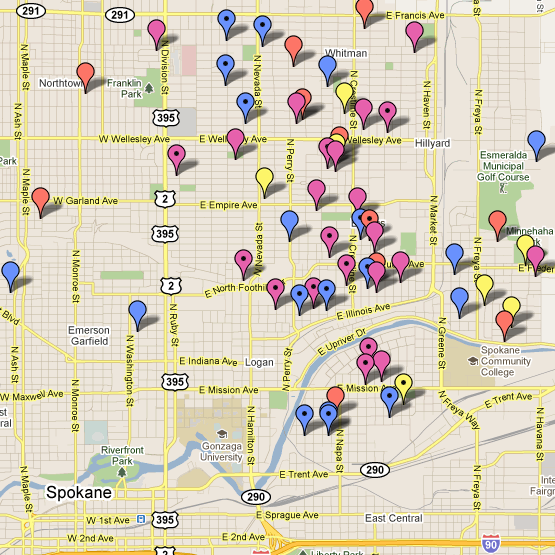 Here's my Google map of Spokane houses, built up over almost four months of searching listings on Zillow, and on Google Real Estate before they pulled the plug. While it lasted, Google Real Estate had the easiest interface to scan maps and zoom in on houses, and then I would go over to Zillow to get deep information like lot size and price history and the wonderful "bird's eye view". Another Zillow feature is to order the search results by newest, so that you can see houses as they come on the market. I think Trulia and Realtor.com also do this. Anyway, on my map, the different colors and dots tell me how closely I've seen a house, if I've rejected it, if I'm waiting for the price to drop, or if it's been sold or removed from the market. I kept watching the rejected and removed ones to see how fast houses were selling and for what price. You can see that I focused on the northeast quarter of Spokane, not too far north because I wanted to be in bike range of downtown, and east because Market Street is a great route north, and that's also where they're planning a new freeway. If they ever finish, I'll only have to do enough city driving to get to the on-ramp at Trent or Wellesley. Also, houses are generally cheaper east of Division. Even if you have a buyer's agent, I recommend that you learn to find your own houses. With the power of the internet, you can get a huge amount of information and investigate properties in ways that even the best agents don't have time for. They have automated systems that can send you listings based on things like square feet and price and number of bathrooms, but they can't sort them for anything qualitative or complex. After location, the main thing I wanted, at first, was a huge yard with good southern and eastern exposure for gardening. I had only a vague idea of what kind of house I wanted, and there seemed to be some great properties for some amazing prices. Back in November I spotted a tiny house on a big lot (7700 square feet) for only $45,000, and rode my bike down to look at it. Of course, in person the house looked shabbier than on the internet. Also it had a vast blank wall on the south side where a window should be, and the deal-breaker was that I could smell the fumes from the gas station across the alley. If a house is cheap and hasn't sold, there's probably a good reason. When the snow came I started working on the map. In early December my favorite was a nice-shaped bungalow that needed some fixing, on a 13,000 square foot double lot with a hedge around it, for only $73k. I figured, with the glutted market and the heavy snowfall, it would still be there in spring. But it sold immediately! This told me that a good house for a good price will sell fast in any market. I had been searching up to $90k, and in January I started searching up to $100k, and suddenly found what appeared to be the perfect house: double lot with garden and greenhouse, brick siding, metal roof, garage, shed, and basement, and only half a mile west of the future Wellesley on-ramp. At this time I did not have the cash to make a reasonable offer, but my sister loved the house and advanced me some of the money we expected in the next few months. Also, I did not have a buyer's agent. My strategy was to zero in on the very best houses, and deal with the listing agent, who would represent me as buyer's agent if I made an offer. The theory was that I didn't need a buyer's agent to find houses, and that a seller's agent who also represented me as buyer would make double commission, and would be motivated to persuade the seller to accept a low offer. But in practice, many sellers are not open to persuasion, and institutional sellers have rigid formulas. In this case the house was a short sale, which means the seller owes more than the house is worth, and both the seller and the bank have to approve the sale. I offered $90k, and the seller came back with $100k, not budging from the asking price, because he didn't believe the bank would go below that. I didn't counter-offer but simply rejected it. I thought the deal was dead. It made me sad, but no matter how much I love a house, I'm going to walk away if I don't get a good deal. A house is probably the most expensive thing you'll ever buy, and ten percent one way or the other can add up to years of wages. Of course, no place is perfect. My "dream house" had low ceilings, a tiny kitchen that could be enlarged only by knocking down a wall, and its big windows were on the west side. In the temperate northern hemisphere, you want your windows to the east and south, to get good morning and midday light. In the warmer months, by the time the sun is in the west, it's going to be so hot that sunlight is an annoyance. So if I didn't get this house, I had to get a house that was better in some way, and I started prioritizing south and east windows. Also, now that I was in it for the long haul, I started to learn more about house construction. I was considering doing my own inspection, with the help of my brother-in-law Sean who has done a lot of contracting. Doing your own inspection is a calculated risk. You cannot match the experience of a professional, but if you do your homework, you can spot things that an unmotivated inspector will miss. If you know how to look for the worst things, and the little things are not going to stop you from buying the house, you have a good shot at saving a few hundred dollars. More generally, I have contempt for the culture of the American consumer, in which people have no confidence in their ability to do anything for themselves, or to recover from a mistake, but have religious faith in institutions and "experts". The next house I looked at was $80k, on a corner lot that was officially average-sized, but effectively much bigger because the yard encroached on city property. I brought a camera and took a lot of photos, and sent them to Sean. He told me that the small cracks in the foundation were not fatal, that the 100 year old post-and-pier foundation was unfortunate but not in bad shape, and that they should have taken off the old siding before they put on the new vinyl, but that the house as a whole appeared to be adequate. Still, that was a lot of yellow flags, and the kitchen had no sunlight. Despite the yard and price, I kept looking. I ordered the book Holmes Inspection by Mike Holmes and studied it carefully. For the next house, I prepared a checklist. At $85k, this one had almost as much garden space as the first two, and the house itself had the long side running east-west with the main windows to the south. This should be normal but it's surprisingly rare. The big flaw was that it totally lacked a basement. I poked around online to see how hard it is to add a basement to a house, and everyone agrees that it's so expensive and difficult that you're better off selling the house and buying one that already has a basement. I started making mental plans to build a root cellar out in the yard, with a shed on top. But when I went to look at the house, the agent told me that it already had an offer. Even if that offer was rejected, I was unlikely to get a good deal. Also, the kitchen and bedrooms were awfully small. At this point I decided to get a buyer's agent -- not to find houses, which I was doing fine on my own, but because I was sick of every seller's agent trying to recruit me as a client. Even though the internet has made buyer's agents half obsolete, the industry is set up for them, and if you try to go without one, you are swimming against the current. Also, unless the low-offer-double-agent gambit happens to work, there is no financial downside to a buyer's agent. Also, if you want to see the insides of ten houses in one day, a good buyer's agent will drive you around, get you inside, and instead of trying to sell them to you, will help you investigate. I was lucky to have a great agent recommended to me. I was told, "She is totally on the straight and narrow, and she is perfectly happy to just show houses," and this was true. She put no sales pressure on me, and she did not ask me to tour any listings just because she represented the seller. A good buyer's agent will not push their own listings. Of course, if one of their listings fits what you're looking for, they'll totally show it to you, but you should be looking overwhelmingly at houses that happen to be listed by other agents. To some extent, this depends on how active or passive you are in picking out houses. If you rely on the agent to do all the work, you can't complain if they turn this to their advantage. We ended up seeing six, and in one day my inside-house experience tripled. I noticed my priorities shifting. I started to care more about house quality and less about yard size. Also I started to develop an intuitive sense of what I was looking for. Choosing a house requires both rationality and intuition, and you have to see a lot of houses before you really know what you want. One of the houses I saw had a perfect basement. I wanted an unfinished basement because 1) you can see how good the foundation is, 2) finished basements are likely to have been finished badly, and 3) if I ever decide to sell it, there is great potential to raise the value for buyers who want a finished basement. This one was unfinished, deep, dry, had great floor joists, and the potential for two extra rooms. Floor joists go across the ceiling of the basement and hold up the main floor, and I think they're a clue to the overall quality standards of the original construction. I wasn't going to buy this house because the kitchen was too narrow for two people to pass, but now I was in love with basements. Having seen all my best prospects, I was ready to lay low for a few weeks. While it would be good to get a house sooner and have the summer to fix it up, I also thought I would get a better deal if I waited until October, with more bubble deflation and sellers desperate to get out before winter. But then one of my "wait for price to drop" houses made a big price drop, and a nearby house came on the market that appeared to be amazing: shaped like a barn, with a metal roof, on a third of an acre, and only a little out of my price range. And since we were going to be in that area anyway, I added two more that were not high on my list. At the last minute, the one with the price drop "went contingent", which means an offer has been accepted and there are still conditions to be met before it goes to "pending" and then sold. Contingent doesn't necessarily mean a house can't be shown, but it did in this case. So that was off the list. We toured the barn-shaped one, and it was much too nice to expect the price to drop, and lacked any basement. And surprisingly, the massive lot felt intimidating. I enjoy having ten acres in the hills that can go wild, but there are social pressures against letting an urban lot go wild, and there could be fines. This was a house and yard for a big family, not a single person. Of the other two, one smelled like urine and was generally in bad shape. The other one I had almost rejected three times -- for being close to traffic noise, for not having a huge yard, and when I scouted around the outside of it, for having a small kitchen. Some people told me that when I saw the right house, I would walk in and just know it. But I'm more rational than that. I told Cami, "This is the first house I've seen where everything is at least adequate." And some things were exceptional. There were two bathrooms, rare in my price range. The kitchen was not as small as it looked, and had a perfect spot for a chest freezer converted to a fridge. The floors were worn but mostly hardwood. The basement was the second or third best I'd seen, and the foundation was the best. The roof was good, there was a garage, and next to the garage was an awning that would work for a chicken coop. The largest window was to the east and the second largest was to the south. There were a few holes in the drywall, and some bad paint choices. In my experience, nothing lowers the price of a house better, without being harmful, than ugly interior paint. I went home and let my intuition chew on it. On some previous houses, I was unsure on the day of the tour, and woke up the next morning with a bad feeling. This time I woke up with a good feeling, and went down to make a bid. This was a HUD house, which means that the previous owners had a loan that was backed by the federal government, and when they defaulted, the feds took possession and put it on the market. Cami told me that some buyers don't want to see any HUD houses, because they're often in bad shape and complicated to buy, while other buyers want to see every HUD house, because they're often great deals. This one was listed at $85k, which seemed reasonable. The peak-bubble tax assessment was 120, and back in 2004 it sold for 93. But I didn't want reasonable. I wanted a screaming good deal. HUD does not make counter-offers. On houses that have been on the market a while, they take electronic bids daily, compare them to a secret number derived from a secret formula, and accept or reject them. Cami called over another young agent with more experience in HUD bids, and he said they had been accepting some surprisingly low bids lately. He suggested I try 70, which they might take but would probably reject, and then I could raise it to 75. To me, 70 felt greedy, and 75 not ambitious enough. We entered a bid of $72,000. The automated emails were still coming. When I opened the new one, the house with the perfect basement and narrow kitchen, also a HUD house, previously listed at $83k, had been lowered exactly 20% to $66,400. This was clearly a better deal at 66 than my favorite at 85, and for a few hours my plan was to switch over to the other house if my bid was rejected. But I was thinking like an investor. In the end, I just didn't want to live in the other house, and I stuck with my plan to go up to 75 if my bid of 72 was rejected. The next morning it was accepted. Then we had a 15 day window to get it inspected. I decided to go ahead with the inspection after all, not to decide whether to buy the house, but just to get another set of eyes to find things that needed to be fixed. The problem was, the plumbing had been "winterized", which means they fill it with only slightly toxic goop that won't freeze and break the pipes. If we tested the plumbing, the goop would be washed out. But if I washed the goop out before May 1, HUD required me to re-winterize it at my own expense, which would cost hundreds of dollars. Also, we already knew from HUD's own inspection report that the lines did not hold pressure. I had already accepted this as part of the low cost of the house. So I decided to just not have the inspector test the plumbing, and Cami negotiated a discount. Some people say to never use your agent's inspector, but I think that's too paranoid. I trusted my agent and she was using the same inspection franchise that had been recommended to me by other people. It did seem that he was slanting his report toward making me feel good about the house. But if your inspector is not totally crooked, you can correct for this by just slanting the report the other way. Bottom line: the house had a few problems, but overall it was solid. It often happens that people see a house, fall in love with it, and then in absence they re-imagine it better than it is. Then on the next visit they're disappointed. (This also happens with people.) Anyway, my mom didn't have much time left, and she wanted to see the house I was buying, so we set up a visit a few days before the inspection. I found that it wasn't quite as good as I remembered, and Cami asked me if I was having doubts. I said "It's seventy-two thousand dollars!" I had budgeted for 90 and would have plenty of slack to fix problems seen and unseen. If you're buying at the top of your budget, you're taking a gamble that there will be no unseen problems. At this point, with a private party sale, we would have moved straight to closing. But HUD takes its time, so we had to wait through most of May. On Monday the 23rd I was told to expect a call from the woman who did the "signing", and we set an appointment for the next morning. I had imagined that I would get together in a big room with my agent, the listing agent, and one or two other people, we would all sign a bunch of papers, I would give them a giant cashier's check, and they would give me the keys. I've heard that some states actually do it that way, but Washington state does it in several stages. First was the signing, in which a traveling notary brought me a bunch of forms. After I signed them, she gave me a page with instructions for a wire transfer, and I took it to my credit union to send the money. If you're borrowing the money, these stages are much more complicated! Then we had to wait for the money to go through, for more documents to be shuffled around between the seller and the title company, and finally for the sale to be recorded by the county. On Friday, May 27, the deed was recorded, and I began the long process of fixing up and modifying the house and yard. This story will eventually continue on the landblog, which will be expanded into a landblog/houseblog.